Would you like to get an accurate picture of the areas you should focus on to improve your online presence? Take the quick digital checkup online and see how digital-ready you are. Once you click ‘submit’ check your inbox for a PDF with your results. You've ticked above that you're already a Tourism Tribe member. This version of the Digital Check up is for our non members only (as it will create you a limited membership upon completion). If you don't have a website, list your business' Facebook page. Did you know? Up to date and fresh relevant content is what will get you up the search engine rankings. It used to be links, now content is king. You wouldn't want people to be turned away after investing so much time, effort and money in getting them there in the first place. If you're not happy with your design there are now great templates available for less than $50. Did you know that 51% of leisure travellers watch video yet only 23% of tourism businesses produce them? Why not start with a simple customer testimonial? TIP: make them downloadable so that your guests can take them in the car if their GPS or Google Maps fail them. Testimonials remove the purchasing barriers and your visitors will see that you care about customer feedback. Why send them to a third party website to check what people say about you when you can integrate a TripAdvisor widget on your site? TIP: collecting emails is the most cost effective way to build a database. Tools like Mailchimp will do that automatically for you, for free. Search engines scan your site for fresh, relevant content. Feed them and they'll come back, find you relevant and rank you higher on search engines. Did you know that if your website isn't search engine optimised it's like having a shop in the middle of the desert, with no signage? SEO is the number one online priority for any tourism business. TIP: make sure your main product pages aren't buried deep down in your menu. You wouldn't want it make hard for them to find what they need. You only have a few seconds to make a good impression. Your homepage is like a hotel concierge. It needs to be able to guide people straight to where they want. Else they'll leave. Did you know that images have a different resolution for the web than for print? If you load high resolution images on your website they will load very slowly and turn people away. TIP: if it isn't your visitors will not bother reading. Plus, Google will penalise you. These days all new designs are automatically mobile friendly. You won't need to pay extra. Why pay someone hundreds of dollars to update your content when you can do it using an interface as user-friendly as Facebook? You own your business name. Would you really want to risk not owning your own web address? If the former owner doesn't pay the domain renewal bill your website will disappear from the world wide web. We've seen it happen too often. If not you risk losing every thing. All your content? Gone. All your SEO? Gone. All your images? Gone. You have insurance for your business? Offsite backups is the insurance for your website. Else, how can you tell if your investment is providing a return? You should have your own login to Analytics and not just receive emails from your web developer. TIP: people get turned away by personal email addresses used for business. It lacks professionalism and credibility. Did you know that this is not the same as a contact form? Why spend all that time and effort convincing people to buy from you if - when they want to - they can't! TIP: That way, you can immediately tell if something's not working with your website. TIP: Why pay staff to do this when it'd cost you less to automate it online? Did you know that many people don't go to Google and start their search on Facebook? If you're not there and active, you miss out. People expect to see it - give it to them so that they don't go searching and find your competitor! Did you know that all if your visitors don't know of the right hashtags all the content they create and post online are going straight in a big blackhole, instead of benefiting you? A picture speaks a thousand words... How many does a video speak? Once again don't let your guests go search for them online and land on your competitor's video. Embedding is super easy and will take you less than 30 seconds with your own content management system. TIP: you'll be able to put them into an email marketing program and send them all your updates. You won't find a cheaper marketing technique! Did you know that people will unsubscribe from your list if you're sending them information that isn't relevant to their needs? Did you know that you can also use this technique to offer them value add such as picnic hamper, massage etc? Did you know that if you send bulk emails via Outlook or similar programs it's likely that most of your email will get caught in spam? If you aren't on TripAdvisor and actively managing your reviews you're missing out on a ton of sales. Being listed on TripAdvisor shows that you care about what your customers think. Did you know that 92% of consumers trust earned media (such as reviews)? 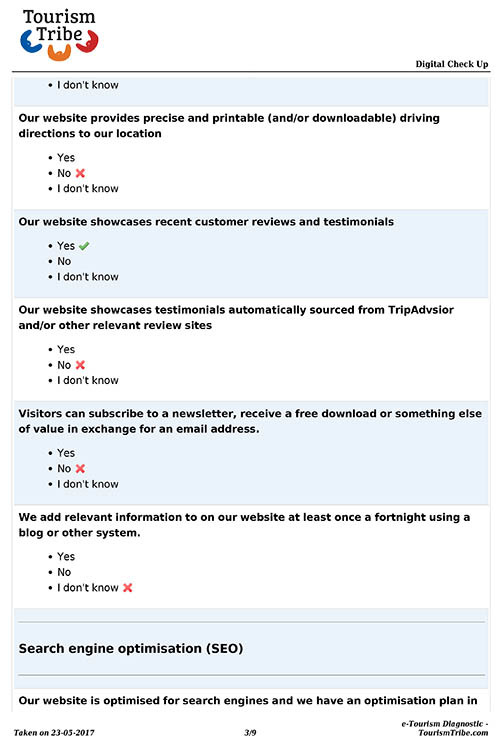 They'll go to your competitor if you don't actively engage on review sites. They've made the effort, show them that you care. Plus, it will do wonders for your rankings! Remember the saying: if you don't ask you don't get?